That orthodoxy, widely accepted among American political elites since 1945, includes an unending national commitment to employ America’s financial resources and military forces in opposition to any challenges to global peace and stability. The dominant assumption has been that America’s broader, enlightened self-interest is best served by a system where peace rules and free trade flourishes. Obama may have begun the process of reorienting America’s global role. But the newly inaugurated Donald Trump is busy shredding the Washington Playbook – as his comments at his inaugural address made clear. Hearkening back to language not employed in the United States since the 1930s, Trump declared categorically that it is all about putting America’s interests first. Indeed, Donald Trump has repeatedly suggested that NATO is obsolete, most recently in an interview with The Times of London. Trump’s logic is simple: America’s biggest security concern is terrorism, and NATO is not relevant to that process. But is Trump correct in asserting that NATO has outlived its utility? Or that NATO’s members enjoy a “free ride” on the back of a security umbrella furnished and paid for by the United States? The first claim is highly questionable. But when we step back from his abrasive tone and language, there is more bipartisan consensus about the second claim among America’s political leadership than we might assume. Let’s look at the evolution of NATO, and each claim in turn. Since its founding in 1949 at the dawn of the Cold War, NATO has commonly been regarded as an intrinsically important, stabilizing force in the West. Originally composed of a dozen founder members, its initial central task was to deter the Soviet Union and its allies in the Warsaw Pact, from invading Western Europe. But times have changed and so have the circumstances. At the Cold War’s conclusion, NATO’s membership spread eastward, incorporating many of the countries that were formerly members of the Warsaw Pact. Today that number totals 28, with Albania being the latest to join. First, NATO forces have been deeply involved in the fight against terrorism. Afghanistan provides the most compelling example. Article 5, a provision in NATO’s original Washington Treaty, stipulates that an attack on any NATO member is an attack on all NATO members. The only time it has ever been triggered was when Al-Qaida attacked the United States on Sept. 11, 2001. Since then, over 1,000 non-American military personnel have died fighting alongside U.S. troops in Afghanistan, all but a few of them from NATO countries. If American policymakers intend to fight a global war against Jihadism, as incoming national security advisor Michael Flynn maintains in his book “The Field of Fight,” then NATO would form a cornerstone of that fight. The second reason for NATO’s continued relevance is Russia. President Trump’s repeated assertions that the United States can negotiate a rapprochement with Russia and potentially drop its sanctions against them have met with disapproval in domestic opinion polls. The idea of forging a working relationship with Moscow in fighting the Islamic State has its attractions for Americans consumed by concerns about terrorism. But the precedents are not good. George W. Bush believed he could work collaboratively with Russia. So did Barack Obama. Both failed. What’s more, both Vladimir Putin’s and Donald Trump’s combustible and confrontational “A-type” personalities don’t suggest that either will give an inch when they disagree. So it isn’t outlandish to anticipate a breakdown in that relationship, and a resurgence of NATO’s importance in central and eastern Europe if incoming Defense Secretary General James Mattis’ comments that Russia is the major threat to US interests gains currency in the White House. But what of Trump’s claims that NATO members are just free riders while America pays for their defense? Here there is across-the-board consensus. Both Barack Obama and Hillary Clinton said the same thing, albeit in more diplomatic language and without the accompanying claim that NATO serves no purpose. Even NATO’s own Secretary General Jens Stoltenberg has recognized the problem and cajoled NATO members to pay more toward the cost of their defense. The math is fairly simple. Each NATO member is supposed to spend 2 percent of its annual gross domestic product on defense. But as its membership has grown, the willingness of the individual members to contribute to the collective defense has conversely waned. That’s because as the Soviet threat declined, most European countries engaged in a wind-down of their defense budgets – what’s commonly called a “peace dividend.” America stopped the wind-down after 9/11. But it’s a process that has continued in Europe to this day. Only five NATO members meet the 2 percent requirement, including the U.S., which spends about 3.6 percent. And of the other four, only the United Kingdom could realistically be characterized as having major military capabilities – the remainder being Estonia, Greece and Poland. 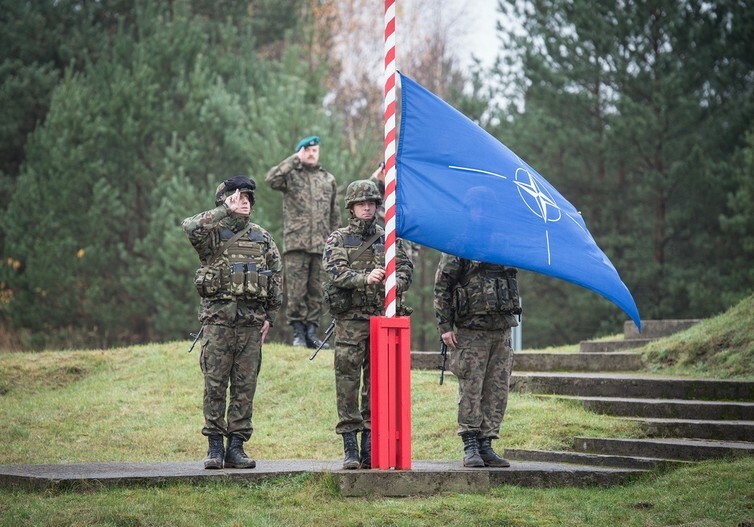 The NATO flag is raised in Poland at the beginning of joint exercises in 2013. Even France, which has Europe’s other truly capable force, spent only 1.8 percent last year. Among the remaining members below the 2 percent threshold, Germany provides perhaps the most startling example. Germany has just announced it will increase expenditure – to 1.2 percent of GDP. What does that tangibly mean? Well, a German Defense Ministry report published at the end of 2015, for example, revealed that only 29 of Germany’s 66 Tornado jets were “deployable.” The air force had no spare parts for the planes. So they had to be scavenged from the more than 50 percent that couldn’t be used. A 2014 report by Der Spiegel magazine (which was challenged by the German Defense Ministry) claimed that as few as seven of Germany’s 67 CH-53 transport helicopters were fully operational, including those being deployed in Afghanistan, and only five of its 33 NH-80 helicopters. Meanwhile, despite the end of the Cold War over two decades ago, the U.S. deploys huge resources to Germany, and throughout Europe, at considerable cost. There is little doubt that most NATO members have reneged on their financial commitment to an organization that undoubtedly serves their security interests. The fact is, however, that NATO has played, and may well continue to play, an essential role in America’s national security, whether it is in combating groups like ISIS or deterring Russian aggression in central and eastern Europe. Maybe the incoming president’s criticisms are simply a ploy to get NATO members to pay more. Maybe these countries will succumb to pressure. Let’s hope that is all it is. Because neither America nor Europe will be more secure without NATO.